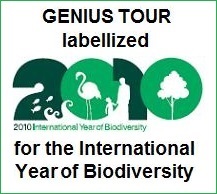 GENIUS TOUR is a databasis that discovers for you museums, parks & other locations that help to understand sciences, technologies and industries whilst having fun. GENIUS TOUR is specially made to give you an easy to use tool and a quick way to find goods such places. GENIUS TOUR is using its own internal search engine to help you the best. Several hundreds of locations spread in France for most of them are described in original papers that are written to go easily and fast to the information you are looking for: GENIUS TOUR is not one of this numerous copy & paste that we can find everywhere in internet. It hence contributes to give you the new information that you are looking for. Museums, parks, aquariums and other locations that you can find here are simply chosen because they have a part in the understanding of all this things that are all around us and because they merge these discoveries with fun. This is why you will be able to find museums and parks that are dedicated to the scientific discoveries. You won't find neither resort parks where this spirit does not fit to our selection criteria, nor prestigious museums that show only artistical master pieces. GENIUS TOUR keeps the information up to date and gives the maximum of details in access plans and directions to find your center of interest. We wish you an excellent surf and great discoveries ! To contact the webmaster, you can post your question at contact @ geniustour.com (take off spaces). This 12th of August, 2018, the Parker Solar Probe was sent into space by a Delta IV Heavy launcher. The lift-off was delayed because of a pressure alert on a tank of the launcher. The exploration mission will go where no one went before: the probe will reach the subburbs of the Sun. The goal of this misson is very important. Actually, we don't know very well the activity in the surface of our star. Several subjects will be studied by the probe that will come closer to the Sun more than 20 times during 7 years, at a speed close to 790 000 km/h! - And many more subjects. They occur randomly in the surface, sending tremendeous quantities of gaz and energy. This energy crosses the distance between the sun and the Earth in around half an hour and comes to hit the magnetic shield of our planet, Van Allen belt. Here, the solar rays are deflected to reach the two poles. Then, on Earth, we can see magnificent auroras that show energy particles that are lithningn whilst crossing the shield layers that have their root in the magnetic poles. However, when we look at electric devices (computers, pacemakers, electric networks, planes, ...), if the magnetic storm is too powerfull, then, overvoltage that can even shutdown these materials can occur. It is very important to understand how these ray emissions and reach the Earth to better protect us. In the ISS for instance, when such an event occurs, astronauts go in their sleeping bag because they are more protected against these rays. This place, sometimes hotter mode than 300 times than the solar surface, is where there are tremendeous exchanges of energies and temperatures, and where is a very intense thermonuclear activity. Why plasma temperature raises so much ? Is it due to magnetic containment local effects that speed-up gaz that come from the solar surface when the depressurize and that work as a natural reactor? Thes particles get phenomenal speeds close to light one. This is why they cross the distance between Sun and Earth in about 30 minutes while light takes 8 minutes to do so. At the moment, we can observe the solar corona only when eclipses happen, of via special telescops that we name coronographes. For instance, the observatory of Pic du Midi in the Pyrenees in south of France or the observatory of Paris-Meudon as well own such coronographes. These phenomena are not very well known. A video of such solar atmospheric phenomenon can be seen in Genius Tour lexicon by clicking here. They were particularly seen per SOHO NASA probes. One goal of the Parker Solar Probe is to start to explain them. These three examples are some subjects the probe will try to explain, after having payed billard with planets: to reach Sun is complex! Eartch run around the Sun at an approximate speed of 100 000 km/h. One needs to slow down the probe to allow it to "fall" towards the Sun. If the probe goes only at 60 000 km/h about, this is already enough. This means also that, compared to Earth, the probe needs to reach the 40 000 km/h... Then, probe will get closer to Venus to adapt its speed that incread a lot. At last, it will get closer to the Sun (that has a 1,4 millions kilometers diameter) and it will be only at 6 millions kilometers of the Sun. There, its shield painted with special products will protect the probe until about 1500°C to allow the electronic devices to stay at a temperature that will not exceed 29°C. This exploration mission is unique and we all hope the obtained results will reach our expectations.